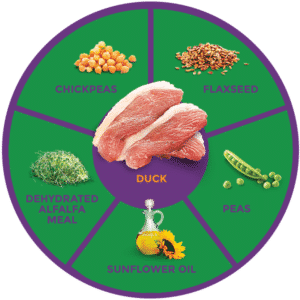 Our Duck Formula provides complete protein, Omega-3 fatty acids, and essential vitamins and minerals for a healthy and wholesome diet. It is a limited ingredient, single protein formula that is balanced with fruits and vegetables to provide powerful antioxidants, dietary fiber, and low glycemic carbohydrates. Our Duck Formula is also grain free and chicken free, perfect for those canines that have food sensitivities or allergies. Not to mention it tastes great, builds lean muscle mass, and promotes healthy hearts. Zignature® Duck Formula – Learned from Nature, Crafted to Perfection. Physiologically Tuned™, limited ingredient premium food for dogs. Hypoallergenic meat first recipe, with no Corn, Wheat, Soy, Dairy, or Chicken, Chicken Eggs, or Chicken By-Products. AAFCO stands for Association of American Feed Control Officials. Zignature® recipes are formulated to meet all the nutritional levels established by the AAFCO Dog Food Nutrient Profiles. This certifies that Zignature® is a nutritionally complete product that can be fed to your pet as its sole ration without adding any other substance except water. For more information on AAFCO regulations, visit aafco.org. We use a limited ingredient formula because when it comes to canine nutrition, simple is best. Zignature® is formulated to serve your canine companions’ needs by delivering the highest quality, well balanced diet. Our limited ingredient formula uses No Potatoes, No Grain, No Chicken, No Eggs, No Glutens, No Tapioca, No Corn, and No Soy. Our Single Animal Protein Formulas provide the highest quality proteins and nutrients for strong muscles and healthy bodies. Duck, Duck Broth, Peas, Duck Meal, Carrots, Chickpeas, Sun-Cured Alfalfa Meal, Agar-Agar, Salt, Choline Chloride, Potassium Chloride, Blueberries, Cranberries, Minerals (Zinc Proteinate, Iron Proteinate, Copper Proteinate, Manganese Proteinate, Sodium Selenite, Calcium Iodate), Vitamins (Vitamin E Supplement, Thiamine Mononitrate, Niacin Supplement, Calcium Pantothenate, Biotin, Vitamin A Supplement, Riboflavin Supplement, Vitamin B12 Supplement, Pyridoxine Hydrochloride, Vitamin D3 Supplement, Folic Acid), L-Carnitine. *Standard 8-fluid ounce measuring cup Note: Feeding amounts may vary by breed, activity level, temperament & climate.